The following WordPress themes bundle is dedicated to every business in the hospitality industry. You can take and use these themes for inns, hotels, hostels, chalets, bed and breakfast, motels, apartment rent, and other related services. Every theme is a feature-rich one and comes with advanced booking system allowing to reserve a room online. 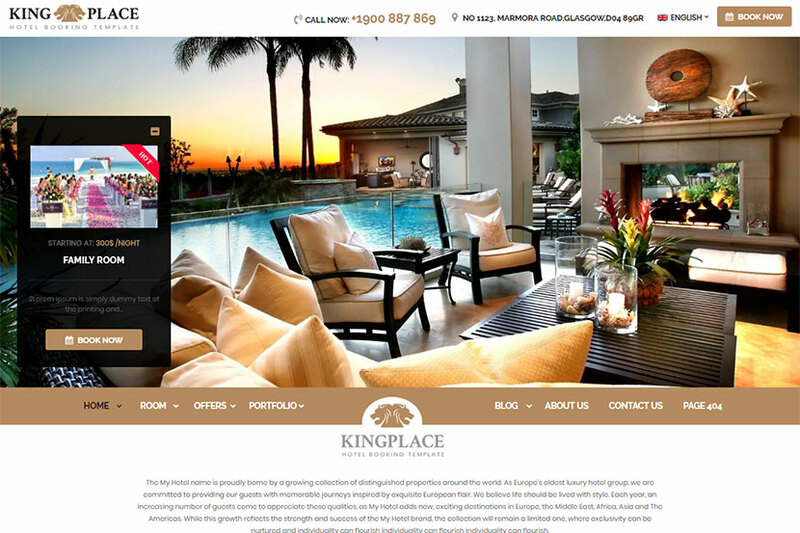 A good-looking WordPress theme made to showcase the advantages of your hotel, resort, accommodation, or rooms for rent. The template is quite suitable for business or agency websites. It comes integrated with WP Hotel Booking plugin which allows to book rooms right on your homepage in advance. As the theme is fully built in Customizer, you get a great number of options for changing the look and feel of your website with ease. It is also integrated with Revolution Slider, 3 types of header layouts, unique inner page layouts, mega menu, 2 room page layouts, and many more features. A trendy WordPress theme especially designed for hotels, resorts, inns, hostels, and other related businesses. If you’re a developer you can take this theme to customize and show it to your customers before they buy it to launch a website. 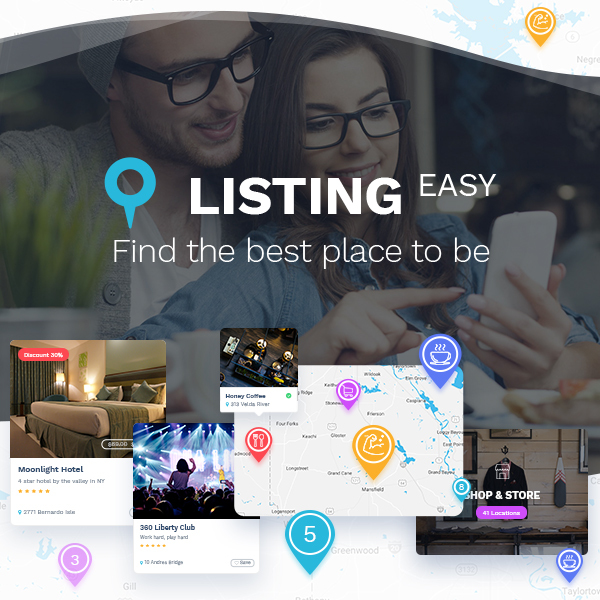 Slick slider, different color schemes, rating/review widget, quick connect feature which allows to contact a hotel staff, online booking system, restaurant reservation form, quick rooms information, sticky menu, map multi objects, and many more features come with the theme. 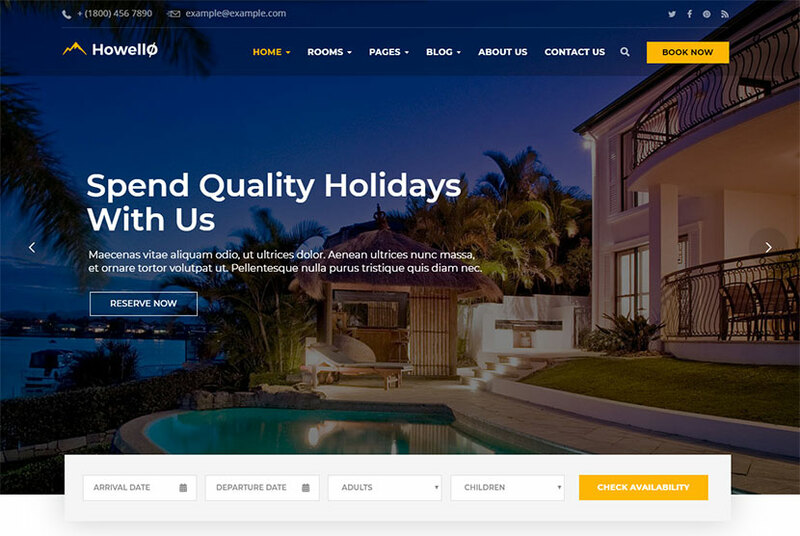 A mighty hotel and resort booking WordPress theme which allows you save the time of your customers by simplifying the process of booking a room. This will also help you get your customers return and as a result – succeed in your business. The theme allows to display all detailed room information in a clear and professional way. You can show off general information, packages, discounts, amenities, and extra price on the ready-made page templates. The theme comes integrated with King Composer, mega menu, Slider Revolution, and a custom plugin which allows to manage booking, service packages, reservation, hotel search, review & rating, maps, pricing, promotion, currencies, tax, email notification, and other options. A modern WordPress theme perfect for hotels, resorts, villas, B&B’s or any types of hotel industry websites. It comes with an eye-catching header with its multiple built-in slides in the banner. The template includes an advanced booking form on the homepage, so it will be simple for your customers to reserve a room within a few minutes and in real time mode. WP native Customizer, Revolution Slider, MailChimp integration, WPBakery page builder with 30+ shortcodes, WooCommerce shop functionality and layouts as well as many more features are included. 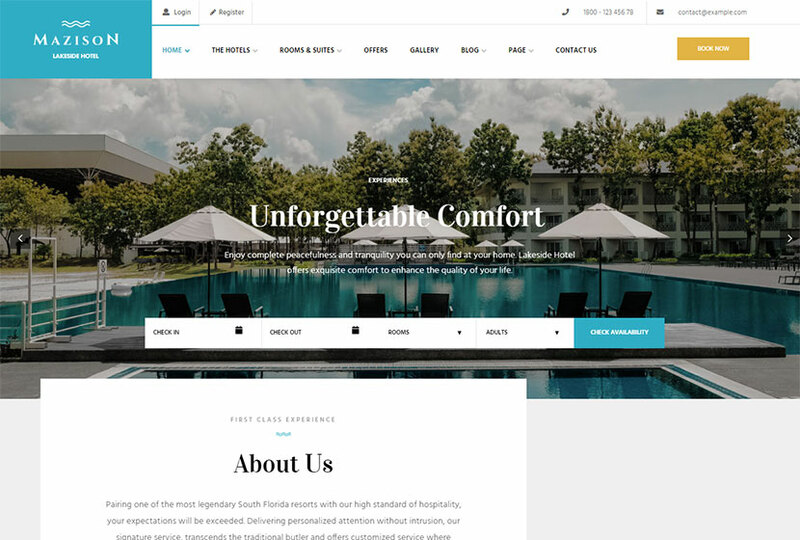 A resort and hotel WordPress theme designed especially for presenting your accommodation, bed and breakfast, resort, or other types of hotel businesses. All accommodation related services are also possible to showcase here. The template is stuffed with a multitude of features which make it easy to edit and transform into a full-fledged website. It is bundled with WPBakery page builder with drag-and-drop interface, so it is simple to create your own unique layouts without any coding. Revolution Slider, WPML support, advanced typography options, Contact Form 7, and more features are available. Another cool WordPress theme especially crafted for businesses providing accommodation, bed and breakfast, and other related services. This template is suitable for inns, hostels, hotels, resorts, and more. The template includes 15 pre-built page layouts, multiple header options, King Composer drag-and-drop page builder, multiple homepages, powerful admin panel, custom page templates, SEO friendliness & Yoast compatibility, font awesome integration, sliding testimonials, translation po/mo files included, threaded comments, third level menu, automatic native image resizing, and many more features. 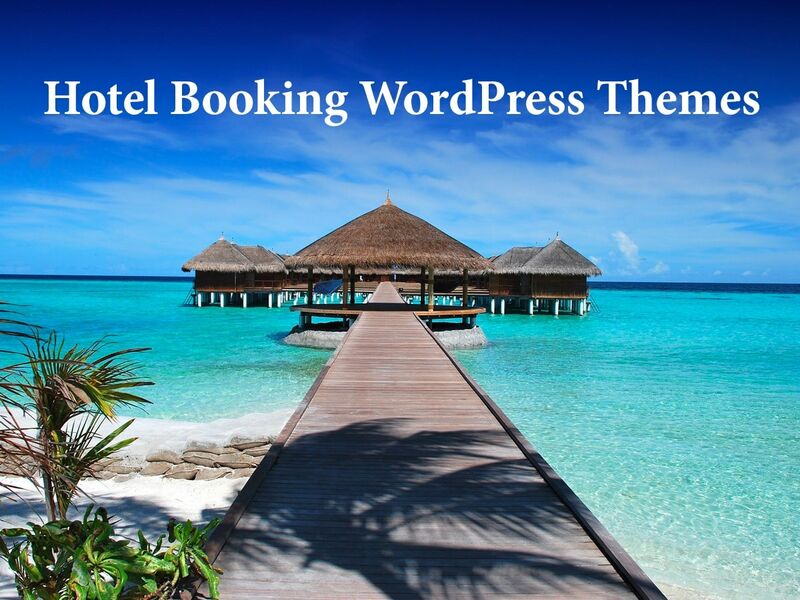 A hotel and resort booking WordPress theme appropriate for all businesses in the hospitality industry. It is quite suited for resorts, hotels, inns, hostels, motels, and other related accommodation services. The features of the theme include extensive admin interface, simple one-click import of demo content, big custom shortcode collection, 6 homepage examples, a large collection of useful inner pages, Slider Revolution, WPBakery page builder, Hotel Room List shortcode, various hotel room list layouts, and many more. 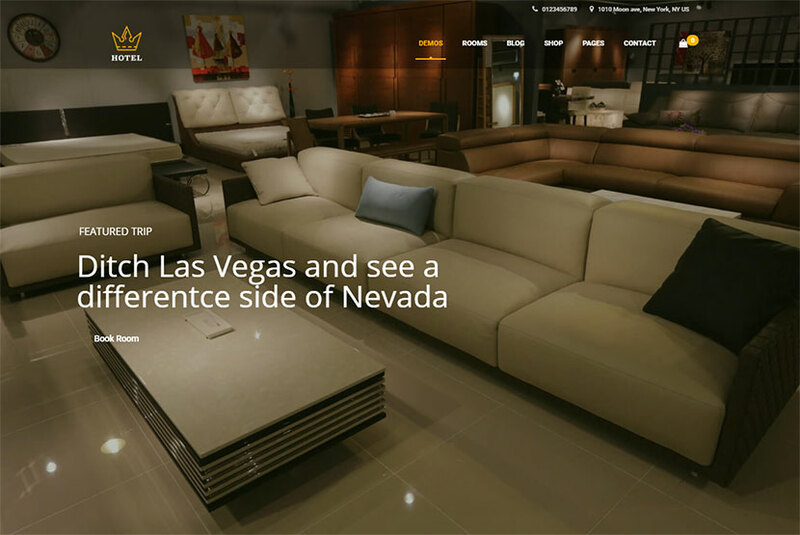 A gorgeous WordPress theme suitable for 5-star hotels and other luxurious resorts. The theme comes integrated with Hotel Booking plugin which provides the website with online booking functionality and solves the problem of online reservation with ease. The template is compatible with a wide variety of useful plugins like Kirki Toolkit, Unyson, WPBakery page builder, Ultimate Addon, Contact Form 7, WooCommerce, YITH Wishlist, Akismet, and more. By the way, it comes with mega menu, full SEO optimization, 150+ shortcode elements, unlimited header possibilities, and many more features. 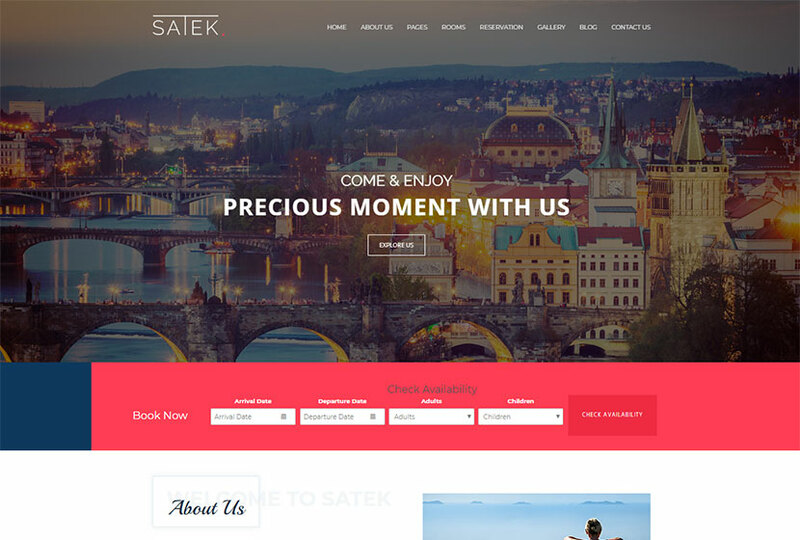 An exclusively designed tours & traveling WordPress theme appropriate for tour operators, travel agencies and other related businesses like hotels, resorts, and inns. 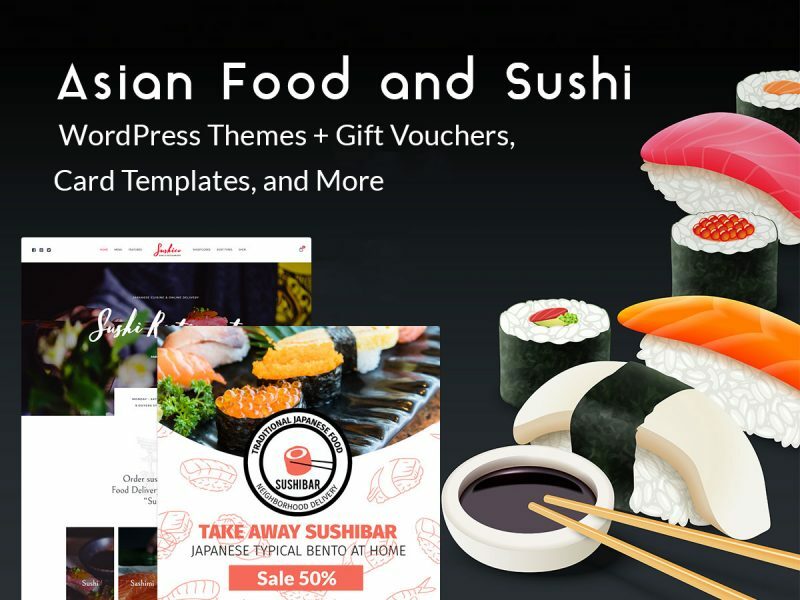 The theme comes integrated with WPBakery page builder with multiple ultimate addons, so you can edit the pages of your website with extreme simplicity using the drag-and-drop interface. It also includes other features like mega menu, WooCommerce support, Contact Form 7, a plethora of shortcodes, and much more advantages. 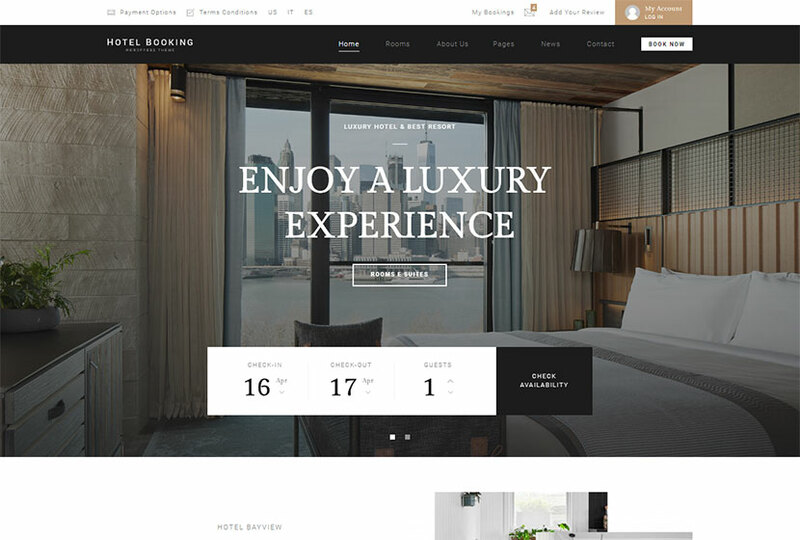 A clean and modern WordPress theme especially designed for hotel, resort & spa booking purposes as well as any kind of travel websites. It comes with powerful booking system which allows to reserve a room online. The template comes with multiple homepage templates, Revolution Slider, WPBakery advanced page builder, MailChimp support, Booking Newsletter, Contact Form 7, child theme Included, super easily customizable room settings, checking form, room layout options, various shortcodes, and many more features. 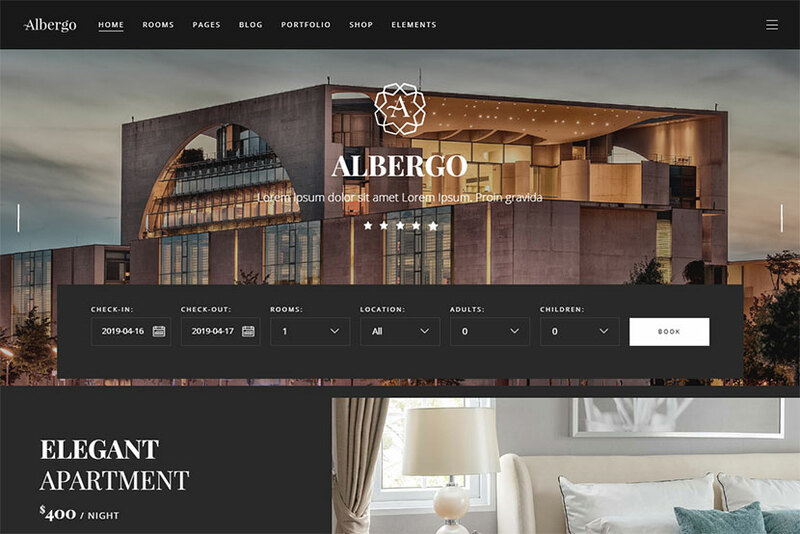 A luxurious WP theme quite suitable for businesses like bed and breakfasts, hotel, hostel, resort, vacation, room or apartment rental services. Easy customization and unlimited color options are only a few things among a wide variety of its possibilities. The theme comes with 4 homepage layouts, advanced reservation and booking system, responsive design, quick setup, child theme support, valid HTML5 & CSS3, unlimited images and slideshows, CSS3 animation, easy editing options, and many more features. A powerful WordPress theme craftily designed for all tourism, rest and travel related establishments like hotels, resorts, hostels, inns, room and apartment rent services, etc. WPBakery drag & drop page builder plugin, Revolution Slider, WooCommerce functionality with all payment gateways it supports, RTL support, custom parallax image row backgrounds, CSS3 animations, advanced theme options, unlimited color presets, child theme included, optional fixed header, and many more features are available. 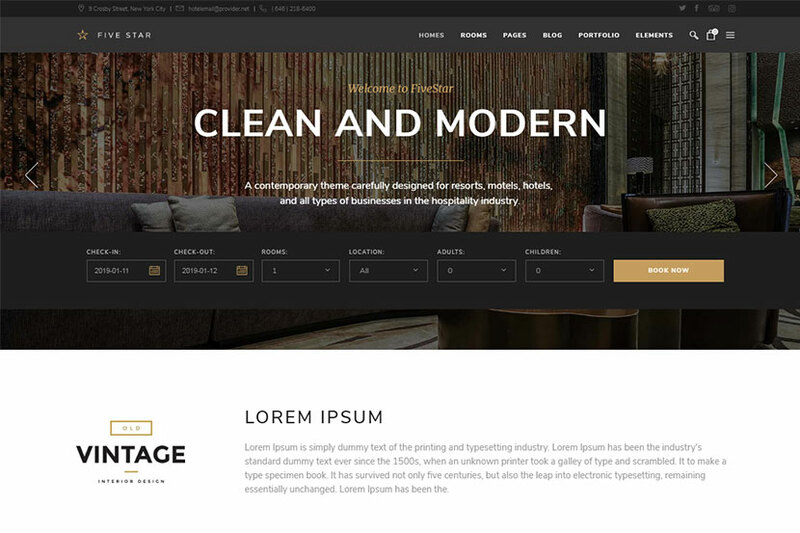 A clean hotel WordPress theme designed for hotels, chalets, bed and breakfast, resorts, apartment rent and other related hotel and tourism businesses. The theme has a “hotel rooms” dedicated page where the owner can showcase the accommodation details available for booking. The booking system allows to reserve a room online in a matter of minutes. 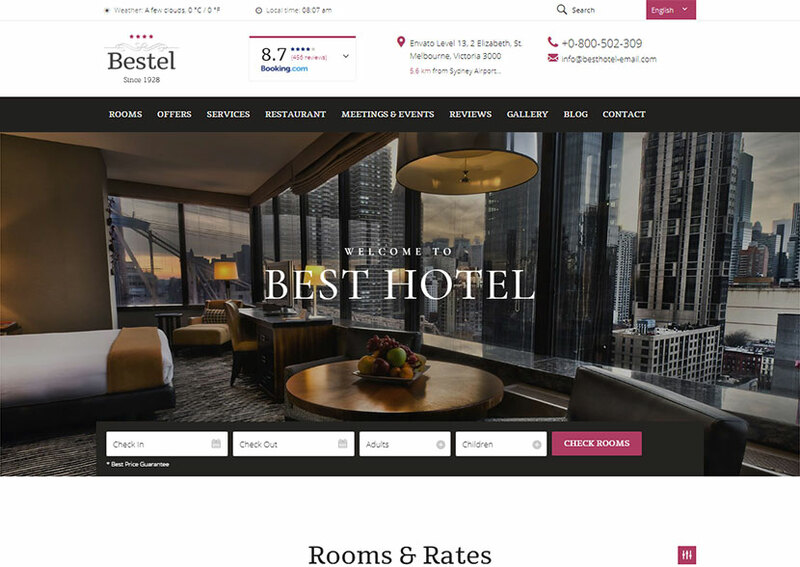 Other features of the theme include various hotel demos, custom Google maps design, WooCommerce support, smooth transition effects, multiple headers, WPML compatibility, and more. 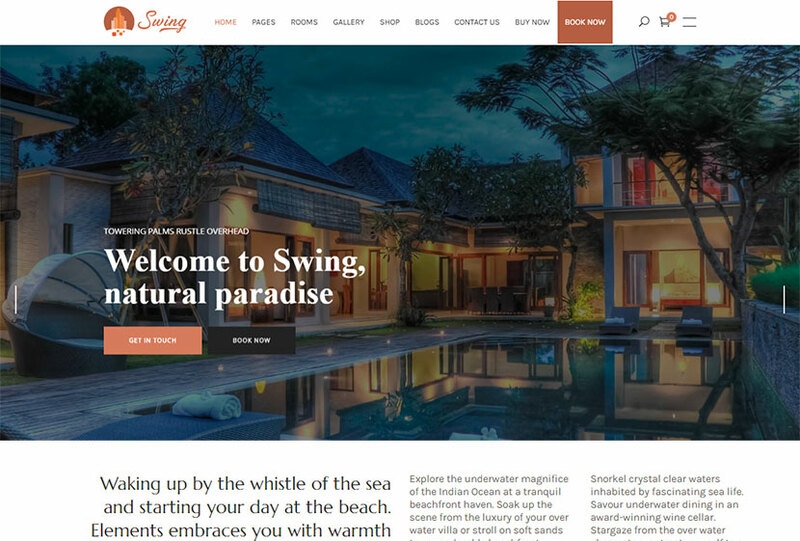 A modern and creative WordPress theme suitable for building an official website of resort or hotel and grabbing the customers’ attention. It comes with a few different homepage layouts suitable for summer or winter resorts, luxury hotel, hostel, bed and breakfast, etc. 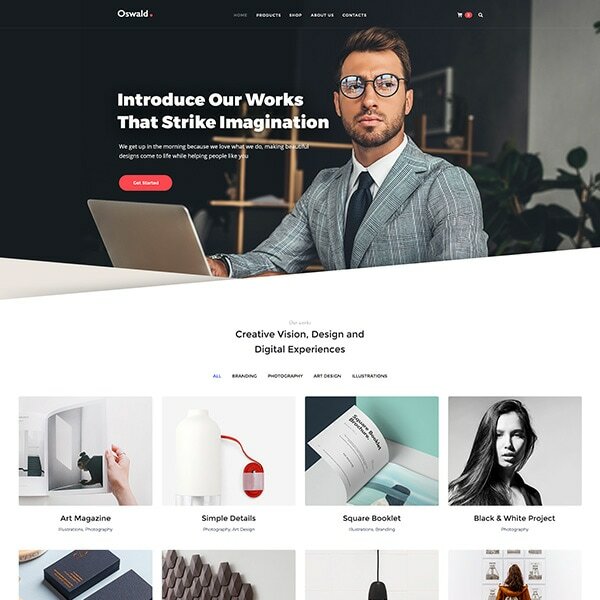 Features of the theme include powerful admin panel, large collection of home and inner pages, extensive typography options, WPBakery page builder, Slider Revolution, hotel room single layout, hotel room list, filter and pair shortcodes, various portfolio hover types, portfolio list loading animations, and more. Make it easy for your customers to book a room right on your website, create a site with a booking system available and simplify the life of your clients.